India got off to a disastrous start, crashing 0-4 against Spain in their opening match of the Champions Trophy hockey tournament here today. 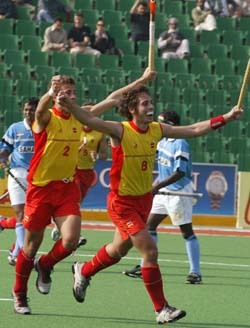 Spanish players Alex Fabregas (8) and Santi Freixa, (2) celebrate their victory against India in the 26th Men's Field Hockey Champions Trophy tournament at National Stadium in Lahore, Pakistan on Saturday. Spain beat India by 4-0. Indian captain Dilip Tirkey promised to fight back into contention in the Champions Trophy after a 0-4 morale-shattering loss against Spain in their opening tie here today. Pakistan warded off a spirited challenge from Germany to register a 3-1 win in their opening match of the Champions Trophy here today. In a dramatic turn of events, no Pakistan Punjab’s player, out of around 300 scheduled to participate in the seven-day first Indo-Pak Punjab Games to be held at Patiala from tomorrow (December 5), could cross over to India from the joint checkpost due to inexplicable reasons here today. The Indo-Pak Games torch entered Patiala today morning with hockey Olympian Balkishen Singh being the first recipient to hold the hallowed flame at Zirakpur. Sportspersons mixed with bureaucrats and politicians of all shades to carry the torch through the main thoroughfares of the city before it was finally carried into the Quila Mubarik from where it will be carried to it onward journey at the YPS Stadium tomorrow. The inaugural edition of the Indo-Pak Punjab Games will begin at the floodlit YPS stadium here tomorrow with a two-hour opening ceremony. The inauguration of the first Indo-Pak Punjab Games at Patiala tomorrow will mark the culmination of efforts for establishing bilateral sporting relations between the two Punjabs which started in 1950 with the visit of the West Punjab hockey team for the silver jubilee celebrations of the Punjab Hockey Association. Maharashtra’s performance suffered a further dip. Having conceded the first innings lead in the first match against Baroda and crashing to an outright defeat in the second match against Hyderabad, Maharashtra seem headed for even worse in the third match against Punjab. A brilliant 99 n.o. by Sangram singh and his 118-run unbeaten fifth-wicket partnership with Ajay Mannu saved Himachal from early collapse on the first day of four-day Ranji tie against Orissa here today. Harmeet Kahlon slipped to joint 18th while Amandeep Johl was trailing at tied 27th after the third round in the Hong Kong Open golf championship today. Former Indian Test cricketer Ashok Mankad and former Indian hockey captain Pargat Singh led their teams to victory in the two-day Vipul Corporate Invitational Golf Tournament at the Classic Golf Resort here today. Bharat Petroleum Corporation Limited crawled back from the brink of defeat to stun Indian Airlines via the tie-breaker 7-5 to bag the 15th edition of the Lal Bahadur Shastri Hockey Tournament at the Shivaji Stadium here today. India got off to a disastrous start, crashing 0-4 against Spain in their opening match of the Champions Trophy hockey tournament here today. Intense preparations for this elite six-nation event came a cropper as the hapless Indians were pounded by the Olympic semifinalists who scored through Alex Fabregas (42nd minute), Eduard Arbos (60th), Santiago Freixa (63rd) and Juan Escarre (65th). In fact, India hardly put up a fight in the contest which saw the European team play cautiously in the first half, only to step on the gas after half time. Spain opened up after the initial 35 minutes during which they hardly took any risk. Both teams were on even terms in the first half but as soon as the game resumed after the break, the Spaniards made their intentions clear. India, on the other hand, hardly displayed any aggression and failed to repeat the performance that they had put up against Spain while drawing the recent two-match Test series at home. Fabregas drew first blood for the Spaniards by smartly deflecting in a fine cross from the left by Francesco Fabregas. There was no looking back for the Spanish who intensified the pressure under which the Indian defence crackled. To compound India’s miseries, Sandeep Singh was temporarily ejected from the ground for pulling down Arbos from behind in the 47th minute as the team plunged into desperation to level the score. But the Indians had no answer to the Spanish onslaught in the last quarter of the game as they conceded three more goals in just four minutes. Arbos scored an opportunistic goal after receiving a free ball inside the circle from the half line before Freixa scored from a penalty stroke to add to the tally three minutes later. Stunned by the Spanish blizzard, India tried to fight back but with their opposition defence holding ground, they failed to get a breakthrough. 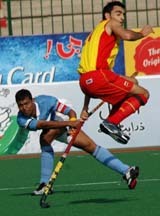 Captain Escarre drove the last nail in India’s coffin by scoring a minute later to seal the fate of the match. India, who made it to this prestigious event by default after Australia pulled out on security grounds, play their next match against defending champions the Netherlands tomorrow. It was a disappointing start to India’s campaign in the elite tournament as they had come to the tournament to redeem some pride which was badly dented after the seventh place finish in the Olympics. Spain pumped in all goals in the second half to win the match quite comprehensively at the National Stadium, but Tirkey said it was too early to write his team off. “This is a young team which has shown its skills in the Test series against Pakistan and Spain. Yes, we have lost the first match, but it would be too early to dismiss us. We have still several matches to go and I am sure my boys will fight back,” Tirkey told reporters after the match. Tirkey said his side lost its lung opener because it goofed up the chances that came its way and also committed defensive blunders. “Missing chances has been an old problem with us. We paid the price for the lapses,” he said. Pakistan warded off a spirited challenge from Germany to register a 3-1 win in their opening match of the Champions Trophy here today. Egged by thousands of supporters, the hosts got the better of Germany after Sohail Abbas (34rd), Shaqeel Abbasi (52nd) and Kashif Jawad (64th) sounded the board at the National Hockey Stadium. Germany’s lone goal came through Montag Jan-Marco who scored five minutes into the second half. Germany, who entered the event without several of their established players, put up a tough fight to deny Pakistan any leeway in the early part of the match before Sohail’s goal just before the half time opened them up. In fact, the Olympic bronze medallists made some good moves and even came close to taking the lead. In the 28th minute, Florian Keller made a fine attempt but goalkeeper Salman Akbar warded off his try. Oliver Hentschel’s second shot from a rebound then went high over the goal. Sohail, world’s leading goal scorer, gave the side the lead with his trademark drag flick but that setback failed to dampen the morale of the Germans. Germany came back from the break with determination and restored parity four minutes after the break with Jan-Marco scoring from a penalty corner. But Pakistan shut the door on the Germans as they scored twice in 10 minutes, Abbasi deflecting in a sharp shot from Sohail Abbas and Jawad converting a penalty corner. Germany play Spain while Pakistan take on New Zealand tomorrow. Defending champions Holland started their title defence in style trouncing New Zealand 5-2 in the tournament lung opener. Holland, seeking to win their third Champions Trophy title in a row, romped home with a comprehensive win riding on Taeke Taekema’s double strike and a goal each by Ronald Brouwer, Rob Reckers and Karel Claver. After a lull for 26 minutes, Holland burst into the lead with Taekama converting from a penalty corner. But the Dutch joy was shortlived as New Zealand equalized just three minutes later through Bevan Hari. Brouwer struck in the 31st minute to put his side back in an advantageous position as the team went to the half time with a 2-1 lead. Bevan came to New Zealand’s rescue with another goal in the 42nd minute to restore parity, but Holland surged ahead with Reckers’ goal in the 44th minute. The Pakistani players were scheduled to arrive today by road. Meanwhile, Chef-de-Mission of Pakistan Punjab’s contingent, Chowdhury Mohammad Yakub, also Inspector-General of Baluchistan police, along with four other members, including family members, crossed over to India in the morning. When asked about the reason of the non-arrival of players, Mr Chowdhury said there was some communication lapse and did not elaborate the reason. He informed that visas of around 180 persons had been cleared and visas of the rest would be cleared by the next day. He added “Some of the players would come today and the remaining would come tomorrow”. However, till the scheduled (4 pm) closure of the border no player had arrived. K. S. Kang, officiating as Deputy Commissioner, said that the players would come tomorrow. He said he had consulted the customs and BSF authorities to help the Pakistan players cross over by early morning so that they could reach Patiala as early as possible. The Pakistan’s volleyball team, which has been here since December 27, was formally accorded welcome by Mr Kang and SSP Kultar Singh here. Earlier, the team members were to join the rest of the players coming from Pakistan. Sports enthusiasts were dejected on the non-arrival of Pakistani players and expressed apprehensions over the smooth conduct of the games and ceremony, which is to take place from tomorrow (December 5). The district officials were present here to welcome the players and had made elaborate arrangements, including over a dozen buses and police escorts, to take them to Patiala. Mr Chowdury while talking to this correspondent said such sports extravaganza certainly helped in raising the standard of games adding that these games required large amount of funds. He said in Pakistan out of the four provinces, Punjab produced the maximum quality sportspersons. However, even then they (Pakistan as well India) were not able to make any mark in the international sports arena. Informing that he was the Chief-de-Mission of Pakistan in the Athens Olympics, he said Pakistan was not able to open its account while India managed only one silver in shooting by Major Rajyavardhan Singh Rathore. Prominent among those who carried the torch were senior athletic coach J.S. Saini, captain of the Indian hockey team at the 1972 Munich Olympics Harmeek Singh, senior athletic coach Bahadur Singh, Asian Games grappler Gurmukh Singh, IG, Patiala range Mr Rajinder Singh, Mayor Vishnu Sharma, and Improvement Trust chairman Mr K.K. Sharma. The Punjab Chief Minister’s brother Mr Malwinder Singh will be the first man to carry the torch from the Quila Mubarik for its onwards journey. The flame will be lit by hockey Olympian Balbir Singh (Senior) at the YPS Stadium in the evening. A notable omission was ace grappler Palwinder Cheema who took part in the Athens Olympics and has won medals in the 2002 Busan Asian Games and the world police games held at Barcelona early this year. The inaugural edition of the Indo-Pak Punjab Games will begin at the floodlit YPS stadium here tomorrow with a two-hour opening ceremony. The uncertainty over the choice of the sportsperson for lighting the ceremonial flame has come to an end with the honour going to former hockey Olympian Balbir Singh Senior. With the agenda of the opening ceremony focusing on synchronising technology with human endeavour and ingenuity, the organisers will strive to project the concept of friendship on the one hand and Punjab, Punjabi and Punjabiat on the other. The cultural and ceremonial committee of the games, headed by PWD Minister Partap Singh Bajwa and having in its ranks renowned personalities like Urdu poet Sardar Anjum, ghazal singer Jagjit Singh and actor Mangal Dhillon, has assigned the task of conducting the ceremonies to the North Zone Cultural Centre (NZCC). The centre had successfully planned and executed ceremonies during the Patiala Heritage Festival last year. Performers have been practising at the Bahadurgarh fort, on the outskirts of the city, for the past month. The script has been written by noted Punjabi poet Surjit Pattar while the artistic aspect will be handled by former Professor of the New Delhi-based National School of Drama, Prof Bansi Lal. Folk dances have been based on the poetry of Prof Mohan Singh and Nand Lal Nurpuri. A massive stage has been erected on which about 500 artistes are expected to perform. A senior IAS officer and the Director of the NZCC, RT Jindal will be the overall in charge of the show. Prominent among the singers who will perform at the opening and closing ceremonies are Harbhajan Mann, Hans Raj Hans, Sardul Sikander, Dolly Guleria, Surinder Kaur, Gurmeet Bawa, Barkat Sidhu and Manpreet Akhtar. Meanwhile, the city has been enveloped with a thick security cover to ensure that the opening ceremony passes off peacefully. Though teams from the two Punjabs had been exchanging visits off and on, there was no forum available for cementing relations between the sports nurseries of the two countries. Incidentally, the two Punjabs have contributed more than 70 per cent of the total sportsmen and women to their national teams since Partition. There has been a long and rich history of sporting relations between the two nations in general and the two Punjabs in particular. Besides the state and national teams, even club teams in hockey, football, kabaddi, and other sports have been regularly exchanging visits to play in invitation tournaments. Milkha Singh, who received the games torch at Wagah, was the toast of Pakistan when he had gone to Lahore to participate in a triangular meet in January, 1960, where he had beaten Pakistan’s fastest runner Abdul Khaliq in 200 metres. Khaliq was, however, declared the fastest man of the meet as he beat India’s Makhan Singh to the third place in 100 metres. The Indo-Pak Punjab Games may not showcase Milkhas and Khaliqs in athletics, or Balbirs and Daras in hockey, yet it is a gallant attempt to bring the best of the two Punjabs together. It is just the beginning and once it becomes an annual feature, the games would provide a big fillip to the Punjabs in regaining their supremacy not only in their respective countries but also internationally. In fact, Patiala has many firsts to its credit in Indian sports. It was Patiala which played host to the first Western Asiatic Games in the early 1930s. The National Games in pre-Partition days were hosted by Patiala more than once. 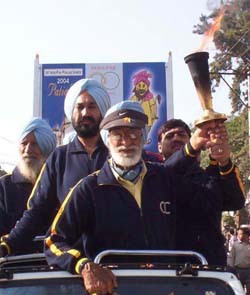 Hostilities and bitterness created by Partition notwithstanding, the West Punjab hockey team led by Olympian SM Yusuf came to Ludhiana in 1950 to participate in the silver jubilee celebrations of the Punjab Hockey Association. Four years later, the West Punjab hockey team returned, this time to play an exhibition match in Jalandhar. It is not only hockey in which sporting relations between the two Punjabs were established after Partition. After an Indian basketball team visited Pakistan in 1954 to play three international and four zonal matches, an East Punjab basketball team landed in West Punjab in 1955 to play at Lahore, Lyallpur, Sialkot and Rawalpindi. India was one of the participants in the first Quadrangular Basketball Championship organised by Pakistan in 1962. In boxing, the exchange of visits started in 1953 when Pakistan boxers came to Mumbai and Kolkata, followed by a return visit by the Indian team in 1953. In cricket, Pakistan came to India for the first time in 1952 and lost the rubber 1-2. In polo, Indo-Pak relations date back to 1954, when an Indian team visited Pakistan for an high handicap exhibition match. Another visit followed the next year before Pakistanis came for a return visit the same year. An Indian Army team visited Pakistan in 1957. In table tennis, the Pakistan team came to participate in the World Championship held at Mumbai in 1952, while in tennis, Pakistanis participated in the 1949 Asian Championship held at Kolkata. It was in the 1954 East Punjab Tennis Championship at Amritsar that Pakistan’s tennis stalwart Iftikhar won the triple crown. Giving an all-round lacklustre performance, their batsmen first made a tame surrender. Their bowlers then proved as ineffective as Punjab were in the driver’s seat by the end of the first day’s play in the four-day Ranji Trophy Elite group Bleague match at the Punjab Cricket Association Stadium, Mohali, today. Put in by Punjab, Maharashtra were bundled out for 123 runs in less than an hour after the lunch break. The agony did not end here. The bowlers failed to achieve any breakthrough as Punjab finished the day at 174 without losing a wicket, already 51 runs ahead in the first innings with all wickets intact. For Punjab, the day belonged to Reetinder Sodhi and newcomer VRVSingh. Sodhi showed his worth as an all-rounder. First he took three wickets with his medium pace to hasten the Maharashtra batting collapse. Then, batting as an opener, he notched up an unbeaten 89 to put his team in total command. Opener Ravneet Ricky remained unconquered on 77. Lanky VRVSingh, who made his debut in the match against Uttar Pradesh on this ground , made most of the opportunity provided by the absence of Gagandeep Singh who has been selected to the India squad for the two-match Test series against Bangladesh. Sharing the new ball with Vineet, VRVSingh first took the crucial wicket of skipper and former India one-day player Hrishikesh Kanitkar and then returned to take three more wickets, including that of in-form Dhruv Mohan, to finish with a haul of four wickets. Maharashtra batsmen were perhaps done in by the Mohali track, which has the reputation of giving help to seamers early on in the day. Expectedly, the Punjab seamers got early purchase from the track, but the type of collapse Maharashtra suffered was stunning. For Maharashtra, the 36-run second wicket stand between Niranjan Godbole and Kanitkar appeared to have steadied the ship after the early fall of Dheeraj Jadhav’s wicket. But the loss of Godbole and then Kanitkar in quick succession opened the floodgates for Punjab bowlers as Maharashtra dramatically slumped to 69 for eight. Operating in tandem, seamers VRVSingh and Sodhi triggered the batting collapse. A 31-run cameo by No. 8 batsman Ranjit Khirid at the fag end resulted in the innings extending beyond the lunch break. Khirid, who hit five fours in his 34-ball knock, emerged the highest scorer of the innings. FoW: 1-9, 2-45, 3-61, 4-64, 5-65, 6-69, 7-69, 8-69, 9-123, 10-123. Bowling: Vineet Sharma 7-3-9-1, VRV Singh 14-3-45-4, Amit Uniyal 7.3-2-22-2, Reetinder Sodhi 11-3-23-3, Navdeep Singh 2-0-10-0. Bowling: Siddiqui 9-1-45-0, Sanklecha 12-0-54-0, Khirid 13-3-35-0, Adhav 9-4-29-0, Kanitkar 3-0-11-0. A brilliant 99 n.o. by Sangram singh and his 118-run unbeaten fifth-wicket partnership with Ajay Mannu saved Himachal from early collapse on the first day of four-day Ranji tie against Orissa here today. the hosts were comfortably placed at 230 for four at the close of the day. Electing to bat after winning the toss, Himachal lost both the openers Rahul Panta (zero) and Sandeep Sharma (7) with just eight runs on the board. Sangram Singh and Manvinder Bisla added 49 runs for the third wicket carrying the score to 57 when Bisla was bowled by D. Mohanty for 32. Sangram Singh, who had scored 92 in last match against Saurashtra on the same pitch, appeared to be in great form and added another 55 runs for the fourth wicket with Paras Dogra who was out leg before at 20, with scoreboard reading 112. Ajay Mannu, who came next proved a big support for Sangram and both of them added 118 runs for the unbroken fifth wicket partnership. Sangram with 99 (n.o.) and Mannu with 50 (n.o.) were at the crease at the draw of stumps. Debashees Mohanty who claimed three wickets for 38 runs was the most successful bowler while Deepak Mangraj took one wicket for 58 runs. Five other bowlers tried by the Orissa failed to get any wicket. Total: 230 for 4 in 90 overs. Fall of wickets: 1/0, 2/8, 3/57, 4/112. Bowling: D. Mohanty 18-8-38-3, Deepak Mangraj 14-2-58-1, P.Mullick 3-0-7-0, Sanjay Satpaty 16-2-56-0, Niranjan 13-6-19-0, S.K. Jena 24-7-34-0, P. Jaichandra 2-0-8-0. RAJKOT: Unbeaten half centuries by middle order batsmen Kanwaljeet Singh (82) and M.M. Dar (62) helped Jammu and Kashmir to be comfortably placed on 243 for the loss of two wickets on the first day of their four-day Ranji Trophy (Plate) Group-A cricket league match against Saurashtra at RMC Ground here today. Bowling: S. Jobanputra 22-2-81-0, S. Maniar 25-5-61-2, M. Thanki 12-1-38-0, R. Dhruv 14-6-21-0, V. Vegda 8-2-23-0, S. Kotak 7-2-11-0, J. Shah 1-0-6-0, N. Rathod 1-0-2-0. NEW DELHI: Right arm medium pacer Sunil Dholpure grabbed 4 for 50 to rock Delhi on the opening day of the Ranji Trophy Elite ‘A’ cricket league match at the Jamia Millia Islamia University grounds here today. FoW: 1-46, 2-50, 3-96, 4-96, 5-104, 6-155, 7-193. Harmeet Kahlon slipped to joint 18th while Amandeep Johl was trailing at tied 27th after the third round in the Hong Kong Open golf championship today. Kahlon returned a two-under 70 in the penultimate round for a total of 207 on a day of swirling winds which made scoring difficult. The Indian who began with a six-under 66 in the first round soon hit the trough with score of 71 yesterday at the $ 800,000 championship at the Hong Kong Golf Club’s Composite Course. One stroke behind was Amandeep Johl with a total score of 208 (71, 69, 68) in joint 27th place, according to information received here. Johl had finished a creditable fifth in the China Open in Shanghai last week. While former Indian cricket captain Kapil Dev and Virender Sehwag stole the spotlight on the opening day yesterday, it was the turn of Olympic silver medallist Major Rajyavardhan Rathore and Pargat Singh to hog the limelight today. Ashok Mankad headed a team comprising amateurs Gagan Verma, Anu Manglani and Ankur Sachdeva and they logged 126 points while the team comprising former Indian off-spinner Nikhil Chopra, Daman Siegal, Amit Luthra and Raj Adhlakha finished second on six points short. On day two, Pargat Singh, Vinod Rao, Manoj Adlakha and Ravi Sannon aggregated 117 points to emerge victorious over the team comprising Kapil Dev, Fazl-ur Rehman, Amar Raj Singh and Romi Malhotra by just two points. Kapil, however, bagged the Cricketers’ Prize with 39 points while former Indian wicketkeeper Syed Kirmani finished second. In the skills competition, Keshav Mishra, who hit 324 yards, won the ‘Line and Length’ trophy while Ricky Lal putted to two inches to win the ‘Blind-folded Monster Putt’. Ashok Mehra won the Sand Play competition. Bharat Petroleum Corporation Limited (BPCL) crawled back from the brink of defeat to stun Indian Airlines via the tie-breaker 7-5 to bag the 15th edition of the Lal Bahadur Shastri Hockey Tournament at the Shivaji Stadium here today. In a dramatic turnaround, with Indian Airlines leading 2-1, BPCL earned their sixth penalty corner just seconds before the final hooter and the bald-headed Len Aiyappa made no mistake as his scoop landed into the net to level the score 2-2 at the end of regulation play. Aiyappa had found it hard to beat the crowded Airlines defence in his attempts off the other five penalty corners, with custodian Jagdish Ponnappa effecting a couple of brilliant saves. But the last one caught everyone napping, and Indian Airlines’ hard-luck story was complete when Sanjay Bir mishit their third stroke in the shootout while the BPCL boys made no mistake with their attempts. In fact, going by the trend of the play, BPCL deserved to win as they had taken the lead as early as the seventh minute when Pundlik Bellary cut in from the right before cracking a top-of-the-circle shot into the goal (1-0). Indian Airlines, with a solid forward line to boast of, comprising Dhanraj Pillay, Brojen Singh and Altaf-ur-Rehman, put pressure on the rival defence, and after wasting a few chances, including two penalty corners, equalised when Brojen Singh connected with lightning reflexes to divert the ball in, following a hit-in from the right by Vimal Lakhra. And two minutes into the second half, Indian Airlines went ahead when Altaf-ur-Rehman scored off their third penalty corner (2-1). Though BPCL tried their best to score a goal in the rest of the session, the Airlines’ defence kept them at bay till Aiyappa came up with that stunning fag-end goal. Extra time was not played due to fading light, and in the tie-breaker MK Prakash, Deepak Sharma, Ravi N, Amar Aiyamma and Prabdeep Singh hit the target for the winners while Bimla Lakra, Altaf-ur-Rehman and Yoginder Gulia got it right for Airlines.